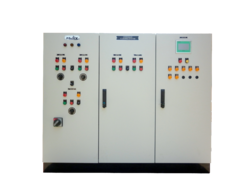 Offering you a complete choice of products which include annunciator panels, frp panel, instrumentation panel, mimic panels, plc panel and remote input output panels. Annunciator Panels display the status of an instrument, a process or an entire system via groups of annunciator lights. Along with sound alarms, annunciator lights alert operators to any deviation from predefined operating conditions for timely response. Color coded lights as well as engraved names beside each, ensure operators are aware of which instrument, process or system is monitored. Our panels can also be connected to computers, printers and other equipments to collect as well as dispense the data generated.Radix Annunciator Panels adhere to strict manufacturing standards in a variety of protection classes - IP52, IP55, IP65, IP44 for different levels of protection against dust and water. Panel enclosures are 1.6 to 2 mm thick, available in a range of materials such as cold rolled closed annealed mild steel (MS CRCA), SS304, SS316 sheets.These materials remain corrosion and rust resistant in highly reactive environments. With a high strength to weight ratio the control panels are made lightweight without any compromise in its strength. Annunciator Panels can be stand alone, self standing or wall mounted. FRP Panels made of Fiber Reinforced Plastic (FRP) offer several benefits. FRP has very low density and is invariably lighter than the same volume of steel or aluminium. It also generally outperforms steel and aluminium in terms of mechanical strength. FRP is also more chemical resistant making it an ideal panel material in areas where chemical spillages may occur, areas typically found in paper, chemical, water treatment and petroleum industries. FRP panels are long-lasting as they will not corrode over time, unlike their metal counterparts. From a safety standpoint, FRP does not conduct electricity, yet is versatile enough to be made to conduct electricity if required by our customers. FRP panels also have great heat-insulation; they maintain their temperature and are easy to touch in normal conditions. They have low-thermal expansion, making them ideal for applications with fluctuating temperatures. FRP panels have very low maintenance and have shown very high durability.Radix FRP Panels adhere to strict manufacturing standards in a variety of protection classes - IP52, IP55, IP65, IP44 for different levels of protection against dust and water. Panel enclosures are 1.6 to 2 mm thick, available in materials such as cold rolled closed annealed mild steel (MS CRCA), SS304, SS316 sheets. These materials remain corrosion and rust resistant in highly reactive environments. With a high strength to weight ratio the control panels are made lightweight without any compromise in strength. FRP Panels can be stand alone, self standing or wall mounted. Find application in large scale process control of complex systems where quick response of the operator is essential to prevent failures. They are typically made for pharmaceuticals, chemical plants and refineries.Radix Instrumentation panels house instruments such as PID controllers, ON-OFF controllers, signal isolators, scanners, differential pressure transmitters and humidity and temperature transmitters. The instruments monitor and control process parameters like temperature, pressure, humidity and flow rate using inputs from field equipments. Color coded lights, sound indicators, engraved text ensure the operator is aware of which is process is being monitored.Radix instrumentation panels can also be used with PLC (Programmable Logic Controller) units and AC/DC drives with an option of remote input or output.Radix Instrumentation Panels adhere to strict manufacturing standards in a variety of protection classes - IP52, IP55, IP65, IP44 for different levels of protection against dust and water. Panel enclosures are 1.6 to 2 mm thick, available in materials such as cold rolled closed annealed mild steel (MS CRCA), SS304, SS316 sheets.These materials remain corrosion and rust resistant in highly reactive environments. With a high strength to weight ratio, the control panels are made lightweight without any compromise in its strength. The instrumentation panels can be stand alone, self standing or wall mounted. Mimic Panel display a complex system in a schematic representation with indicators for relevant components. Along with sound alarms, this allows operators to check the status of and pinpoint problematic sections for quick and focused response. Mimic panels find application in industries with intricate processes such as cement plants, refineries, smelting plants, power plant, petroleum, chemical plants and paper mills. In processes requiring early detection and quick response to prevent fire hazards, chemical leakages or explosions, mimic panels are especially useful.Radix Instrumentation Panels adhere to strict manufacturing standards in a variety of protection classes - IP44, IP55, IP65, IP52 for different levels of protection against dust and water. Panel enclosures are 1.6 to 2 mm thick, available in materials such as cold rolled closed annealed mild steel (MS CRCA), SS304, SS316 sheets. These materials remain corrosion and rust resistant in highly reactive environments. With a high strength to weight ratio the control panels are made lightweight without any compromise in its strength. Mimic Panels can be stand alone, self standing or wall mounted. 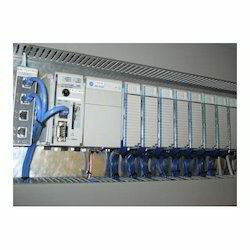 PLC Panel integral part of most system automations. PLC Panels also accommodate the various equipment that support the PLC – power supply, relays, controllers, input/outputs, wiring etc. Each panel is sized depending upon the scale of the system and PLC. 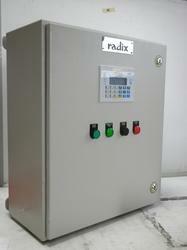 Radix also provides quality documentation to ensure the PLC Panels are easy to install, commission & operate. Remote Input Output Panels (RIO) are used in applications where it is essential to have an field unit from where an individual subsystem of a process can be monitored and controlled. The data is then transferred to a centralized data collection point.Remote IO Panels do not need extensive cabling and can be conveniently placed for a range of applications. They are generally located on field, near the point of application. Remote IO Panels can be easily integrated with a Remote IO based system. They find applications in industries where individual subsystems of a process need to be monitored and controlled like in chemical plants, pharmaceutical facilities, power stations, power generation plants and oil refineries. Radix Remote IO Panels adhere to strict manufacturing standards in a variety of protection classes - IP52, IP55, IP65, IP44 for different levels of protection against dust and water. Panel enclosures are 1.6 to 2 mm thick, available in materials such as cold rolled closed annealed mild steel (MS CRCA), SS304, SS316 sheets. These materials remain corrosion and rust resistant in highly reactive environments. With a high strength to weight ratio the control panels are made lightweight without any compromise in strength. Remote IO Panels can be stand alone, self standing or wall mounted. 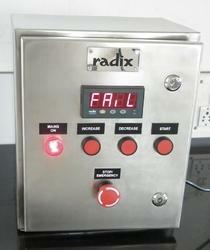 RADIX offers Ready to use Control Panel for electrical furnaces, ovens or any other electrical heating system, which can be used by the OEMs or the end users. The panels are fabricated using CRC MS sheet duly powder coated / EPOXY coated (usually Siemens Grey colour -other colour shades are also available on request) or in Stainless steel. 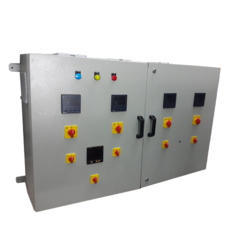 These panels comes fitted with accessories depending on the application like highly accurate and versatile controller,safety controller, PLC, HMI. Current meters, Energy regulator, MCB / MCCBs, safety contactors, etc. The incoming power line MCBS or MCCBS of suitable ratings are used for switching the electrical supply to the panel. Suitably rated fuses are incorporated per phase or per heating arm. 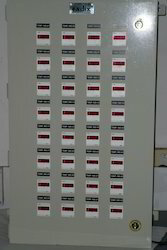 Digital or Analog current meters areinstalled on the panel to monitor the current flowing through the load. 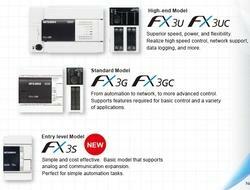 FX3s series is the 3rd generation of micro programmable controllers. High speed, large capacity, and enhanced performance and functions are assured. These panels comes fitted with accessories depending on the application like highly accurate & versatile controller,safety. Equipped with excellent expandability for analog, communication, Ethernet, and positioning functions, a whole world of FX applications awaits. PLC Automation Control Panel to strict manufacturing standards in a variety of protection classes - IP52, IP55, IP65, IP44 for different levels of protection against dust and water. PLC Panels can be stand alone, self standing or wall mounted. 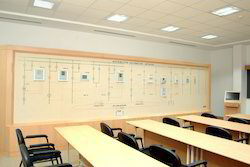 PLC Panels can be stand alone, wall mounted or self standing.